You know you don’t get there often enough, but God knows you surely try. Sailing, it’s a Magic kind of Medicine that no Doctor could prescribe. Hope to be sailing with you soon! Beat the rush and call 305-407-4141 today to make your reservation! Bareboat Express to the Dry Tortugas! Southernmost Sailing School Opens a New Bare boat Express Adventure To The Dry Tortugas! (minimum 2 students) for 16 hours of instruction over 2 days. 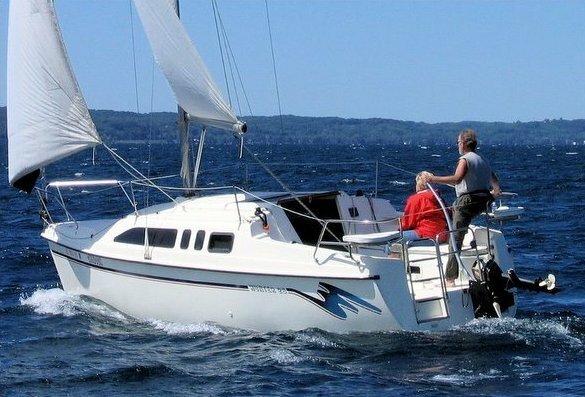 Learn to skipper a 26′ sailboat by day, in light to moderate winds and sea conditions. Learn basic sailing terminology, parts and functions, helm commands, basic sail trim, points of sail, buoyage, seamanship and safety including basic navigation rules to avoid collisions and hazards. Our 26′ 1994 Hunter sloop rigged sail boat with a tiller is the perfect boat to learn in, it also has a 10hp out board. We try to have 2 students at a time, so if you’re by your lonesome, we need to charge $810.00 for private lessons. 101 Keel Boat is done in light to moderate winds, (oh and by the way the hunter will NOT tip over). Our practice area is only 1 mile from Beautiful Sunset Marina and is protected on 3 sides by land, so even if, there is a lot of wind, we are pretty well protected and its only 10 feet deep in the whole area and we never lose sight of land. Easy Peasee, and it’s really fun. 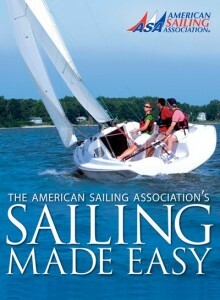 Through my training, you will be able to pass the ASA 100 question Test and on the water sailing exam. Call to book today at 305-407-4141. (minimum 2 students, a private lesson $900.00) for 16 hours of instruction over 2 days. Learn to skipper a sloop-rigged auxiliary powered 26′ keelboat by day in moderate winds and sea conditions. Learn cruising sailboat terminology, basic boat systems, auxiliary engine operation, docking procedures, intermediate sail trim, navigation rules, basic coastal navigation, anchoring, weather, safety and seamanship. This class is also minimum 2 days and 2 students, about 4 hours in the class room and 12 to 14 sailing on a course, usually to a Beautiful Reef for a lunch break and snorkel. You are going to know Chart Navigation with all the fun tools and a GPS, more sailing and boat handling, sail trim safety, and communications at sea, will prepare you for the ASA 100 question test and on the water sailing exam. (minimum of 2 people and 2 days) and includes an over night stay at sea. Learn how to sail a sloop-rigged, auxiliary powered sailboat during a multi-day cruise upon inland/coastal waters in moderate/heavy winds and sea conditions. Learn about provisioning, boat systems, auxiliary engines, advanced sail trim, coastal navigation, anchoring / mooring, docking, emergency operations, weather, and more. On Last Call, this class is also a minimum of 2 days and includes an over night stay at sea. This class covers the information on the different systems on board such as electrical, heads, holding tanks, water systems, minor diesel engine maintenance. Also included is provisioning, cooking plus more on docking and mooring, which is preparing you for the cruising adventure of your life. The price of this trip is flexible depending on the food and lodging. There is a ASA 100 question test as well, but by now we know you can sail! Learn basic docking skills for boats with single inboard or outboard engines. Discover the basic theory and hands-on techniques needed to dock and undock boats in an efficient manner and without damage or injury. 1 student here is fine. for 16 hours of instruction over 2 days learning how to get on and off the dock like a pro in all different situations understanding the forces that affect the single engine vessel and how to control them. There is a 33 question test at the conclusion of the class and a certification for your log book. We can also provide extra time to work on docking with any other class at an hourly rate. Help stamp out DAD, Docking Anxiety Disorder!!! Half day – $300.00 for 4 hours (student only). Half to full day on-water skills review clinic is targeted to meet the needs of ASA certified sailors who either need a “refresher” or those who sail more regularly that wish to get focused instruction in a few areas (e.g., docking, sail trim, etc.). In an effort to keep our sailing educational program as cost effective as possible to our students I am offering à la carte pricing. This way you can get just what you want and put together your own custom program to maximize your training. You can combine some fun things to do in and around your training such as snorkeling, wild dolphin watching, fishing, or just sailing. Ask us about our live-aboard experience, fly into Key West airport, we pick you up and bring you to Sunset Marina and you sail to the Bight Marina with the Captain, you are within walking distance of Duval Street. The captain joins you at 9:30 the next morning for your class. This is at least a 2 night experience and at the end of your class, you return to Sunset Marina and leave for the airport. This experience can be adjusted to fit the students ideas of fun and length of stay. 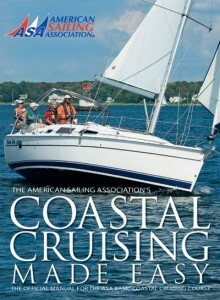 If you want the ASA Certification that is $85.00 and includes the official log book, your membership to ASA for 1 year, plus a subscription to Sailing Magazine. 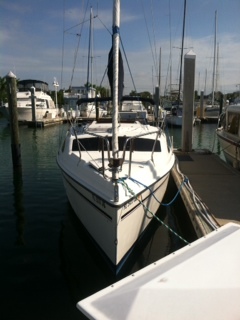 Additional hours sailing the 26′ Hunter are at $75.00 each for students and their families up to 5 persons. We have 4 sets of new gear ready for your use with towels and a deck shower to rinse off with free and since I have been sailing around here for 6 years I know where the best places are to go. It is one of my favorite things being surrounded by a pod of wild dolphins if we get lucky and find them. I was a charter captain in key west and used to go out and find the wild dolphins every day for 3 years with a 97% success rate finding them so your in good hands here. We troll by sailing catching a variety of different fish that we release after a quick photo. Really fun and great fishing here. I have all the gear ready for you to use. If you are a student and would like to add another day of sailing its just $75.00 per hour 3 hour minimum for the boat the captain and fuel ect. So take an extra day to go out after completing your course to hone your skills and bring the whole family. Flotilla Members (Repeat Customers w/ Certification) get discounts. Bike rentals $25 for 2 days. Bikes available are single speed beach cruisers with basket, lights and locks. Each additional day is $10 per bike. Southernmost Sailing School offers various packakges to meet your needs. All our classes have a 3 person maximum in order to ensure personal attention to get the most out of your class. If you prefer to learn on your own, we also offer private lessons. We will be back at the docks by 4pm, so you have time to clean up and go out for the evening on the bikes. LEARN by day and PARTY by night in Key West! I know it sounds to good to be true. Click on each tab below to learn more about our courses. For Charter information, click here. Book Now, GET ON THE WATER ASAP! Southernmost Sailing School also offers charters to go out and explore our waters. We offer bareboat, overnight, half day, full day and sunset charters. Bareboat Express to the Bahamas! 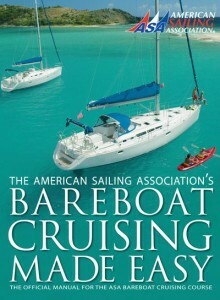 Southernmost Sailing School Opens a New Bare boat Express Adventure To Bimini in the Bahamas.